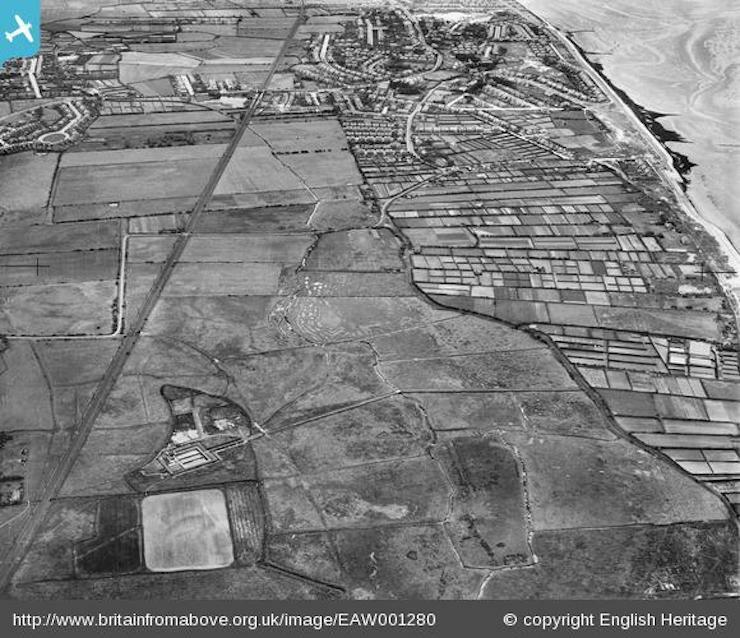 I was browsing the Britain From Above website earlier and spotted a couple of new photos for Hoylake and Meols. The aerial photo above (source), was taken in June, 1946 and shows what is described as the Wallasey Corporation Sewage Works (presumably that big square and building next to it and not to be confused with the current United Utilities plant) and the allotments at Parkfields. You can make out the location of Meols Station where the railway line intersects with the main road with Meols Pond next it and Barn Hey Crescent further to the left. Looks like there used to be a lot of allotments down there …you can’t get one today for love nor money of course, waiting lists go on for years ahead! So when was this area subsequently used as caravan parks – after 1946 obviously? Does anyone know who owns the fields down Park Lane today – is it all private land or does the Council own any of it? There used to be an accessible air-raid shelter in Park Lane and my old penknife might possibly still be there somewheres! I can also recall that the detached house on the road, just off the corner at Bennets Lane was derelict for years and you could sneak in there too if you dared. That was after you had a rummage through the old black cars that used to be in the farmer’s field at the end of Cleveley Road. If you go down Park Lane (bike or foot), past the caravan parks you’ll come to a gate – turn left on the path that takes you to the prom or go straight on, through the gate and along to Leasowe Lighthouse. Mind that the narrow path is accessible though, as last time I ran along there it was pretty overgrown. Not allotments but market gardens used to stretch from Hoylake to Wallasey. Now that so much veg is flown in from abroad, sadly ‘horsiculture’ and eyesore caravan parks have taken over. Not a change for the better. Actually, John is right – they were allotments in 1946 and market gardens afterwards. We would love to have that many allotments again in Hoylake. It would make a lot of people very happy, and as you say, Peter cut down on expensive, imported, vegetables. Parkfields was not allotments in 1946. It was owned by my father and his cousin and was a market garden business called Stanley Brothers. The family bought the land in 1893 and set up business there. I have a record of the Auction poster for the sale. .In adjoining fields a family called Biddle set up Market Gardens and eventually a camping site called Burbo Camp. And I think there was also another Market Gardener called Meadows. Water supply in summer was a problem.. I have read everyone’s comments. I am trying to find out more about my grandad who was a Market Gardener in Meols. My dad has just turned 80 yesterday and sadly has Dementia but he is remembering things from years ago and I would love to know more. I never got to meet my grandad. My grandads name was Charles Langley and my dads name is Colin Langley. Sorry I missed this off the above comment box. I think I might be able to help here. my father was Alan Biddle of WL&HN Biddle Ltd. Langley is a local Meols name. My father was born in 1918 and died last year. He employed someone called Langley on the market gardens. There was a local historian Frank Biddle, who’s daughter still live in Moreton I think.. I grew up in Park road. I can add a little to this – although from a more recent time. My mother is a Langley (one of seven) she grew up in Meols living in Sea Bank Cottages off Bennets Lane, although you can no longer see the cottages as they are surrounded by new houses. My uncle still lives there to this day. My mother spent a number of years in 70’s and 80’s working on the market gardens shown in the picture. Where Carr Lane joins Park Road (near the island) there was a market garden owned by Gordon Wright (I think). Although hard and at time wet cold work my Mother speaks very fondly of her time there. Alas Gordon sold up many years back and I think it’s all static caravans now. All my aunts and uncles still live on the Wirral, especially in Meols and Hoylake. I also believe there is another Langley (Howard ?) who may still own/rent a market garden in Hoylake tucked away behind the station. Hi, does anyone have a photo of the Stanley brothers or of the market garden? I am currently researching my family tree and looking for info on Charles Stanley who married Ivy May Williams (also known as Dollie). Any pics would be much appreciated. I m looking for info on Burbo Bank campsite. My parents had a marque tent there in the late forties. My mother, my sister and I would spend all summer with my dad travelling back and forth to work in Birkenhead by train. My parents were Jim and Edith Fairley. Another of the market gardiner not mentioned was Jo Price who had ,and in Meols and I believe off Carr Lane. My great grandmother bought a tract of land which her two sons Walter Lesley and Henry Neville Biddle worked. It extended alongside Burbo Camp to the sand dunes. At this point is the house Marine View where they lived. Greenhouses were erected at this site which was the hub of the operation. There was another tract of land by the Tower house which still stands sans tower. They rented ‘ the Links ‘the triangular section near the light house, This was once a ladies golf course. A third area off Park Lane is near,y opposite the nissan hut. A packing shed adjacent to the Lane was built to accommodate the packing and washing of the produce before it was loaded onto lorries to be taken to the Liverpool fruit and vegetable market. Burbo camp I believe was part of the original land purchase. When we were children the tented site was managed by Henry Biddle’s side of the family. Burbo Camp was owned by WL & HN Biddle Ltd, their sons William (Billy) Biddle and (my father) Alan Biddle then ran it. Billy died quite young of a heart attack and the firm was restructured to pay his death duties. At that point Billy’s widow Marjorie had a house built by the camp and took over it’s management. I’m guessing she was given ownership, but I don’t know the details. This happened in the 60’s. My brother Tim will know more. Thank you Stephen for your reply. I have a holiday home on the site and really love it. It. I’m interested in the site’s history. There is an old farmhouse and converted outbuildings on the site alongside a much more modern detached house. The site is very clean and well maintained. I’ll see if I can dig out some photos. In it’s heyday the farm yard there had a stable with hay loft and a row of green houses, which were coke fired. The coke being a bi product of the gas works. We used to grow cucumbers and beans. I had a pony, which I used to graze on the camp in the winter, when the caravans were moved off the field. Thanks very much Stephen. Can’t wait to see them but no problem if you cannot locate them.